I can’t believe all the fabulous cooking tips I picked up from this new book in the Bakeshop Mystery series. Not only do we get a really good read with loveable characters and fascinating story lines, we get the urge to cook as well! Can it get any better? Alexander just keeps getting better – her characters are gaining more depth with each book and her descriptions of Ashland, Oregon are so real, I feel I’m walking the streets. She always leaves us wanting more; wondering where and who the next body will be, what’s going on with the wedding of the Professor and Mom, and especially what’s happening with Carlos. All great questions, leaves us eager for the next chapter in the life of Jules and company. Wonderful book I will be recommending! Now it’s time to start baking. Seventh book in A Bakeshop Mystery series! 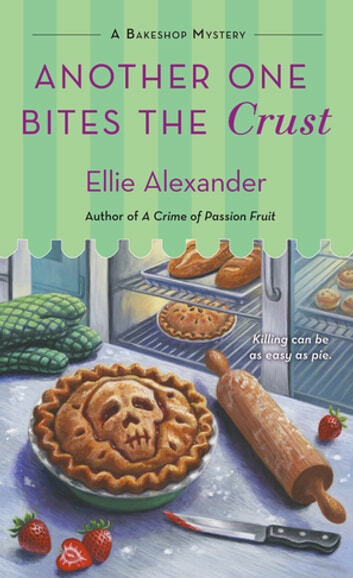 Another One Bites the Crust by Ellie Alexander is the seventh book in A Bakeshop Mystery series. Jules Capshaw co-owns Torte with her mother (Helen) in Ashland, Oregon. The new season of the Oregon Shakespeare Festival is getting ready to start which will greatly increase the traffic to their bakery. They are also busy with the remodeling of their new space, planning Helen’s wedding to Doug (aka the Professor) and preparing treats for opening night of Antony and Cleopatra. Then Lance, artistic director for OSF, enters with a new request and drama. Lance is acting a little stranger than normal (an understatement). He feels that the actor playing Antony (who will only answer to Antony) is attempting to oust him and he wants to hold a preseason party with authentic Shakespearean dessert buffet (oh boy). While they really do not have the time for Lance’s party, Jules cannot deny his request (even though he wants to her to use recipes from the 1500s and have the party in one week). The party is a hit, but there is altercation between a tipsy (again an understatement) Lance and Antony. Later that night, Lance arrives at Jules home with blood on his hands and clutching a dagger. Antony is dead (not a shocker) and Lance stumbled upon his body. Lance is the prime suspect (of course) and is arrested. Jules with assistance from the Professor and Thomas work to prove his innocence. Someone is setting Lance up for the crime. Who could have wanted Antony dead? And what is the actor’s real name? Another One Bites the Crust is nicely written, has a good pace, contains well developed characters and a charming town. While Another One Bites the Crust is the seventh installment in the series, it can be read alone. The author provides the needed background details. The cozy elements that readers of this genre love are present. A charming town, quirky yet lovable characters, someone to dislike (Richard Lord), a bakery with delicious descriptions of baked goods, a Shakespearean play with accounts of the beautiful costumes, Jules creating delectable delights for Lance’s party, a hint of romance, Stephanie’s lack of sleep, Lance acting nuttier than usual and wedding planning. I do feel that we do not need the details on every item that Jules decides to create (it can become tedious after the third, fourth, then fifth time). I was thrilled that Carlos was not featured in this story (I am tired of his storyline). It does seem, though, that Carlos’ story is not finished. There is a hint of what is to come (hint: remember what Carlos gave Jules). The mystery is medium level. The killer can be discerned before the reveal (just follow the clues). The investigation consists of questioning people, our sleuth sharing information (with Lt. Kerry, the Professor, Thomas), and Jules thinking and speculating. I appreciate that the author gives us competent police officers and detectives (hooray). While Lt. Kerry is a rule follower (and intelligent), she is not rude, dislikeable or idiotic (or all three). There is just the right amount of humor in the story. While Lance is an over-the-top character, he is the only one (thank heavens). I liked Thomas and Jules getting to spend some quality time together with a little flirting (can you tell I am Team Thomas). 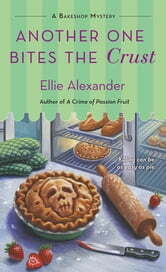 Another One Bites the Crust is a light, entertaining cozy mystery.